The 2012 Blue Whiting Acoustic Survey starts today, and will continue for the next three weeks. This is an annual, co-ordinated, international survey with research vessels from Ireland, the Netherlands, the Faroe Islands, Norway and Russia at sea at the same time. We are looking for blue whiting, Micromesistius poutassou, a pelagic fish species found throughout the North East Atlantic. Blue whiting is an important commercial species, mainly used for fishmeal, but also for human consumption. Because it is a shoaling species, living high up in the water, we can use an echosounder (acoustics) to count the number of fish beneath the boat. By covering a large area, and comparing and adding our figures to those of the other vessels, we will be able to calculate the blue whiting stock size. The Celtic Explorer will leave Killybegs before dawn tomorrow. We will then make the short journey to St. John’s Point where there is some sheltered, deep water to calibrate the acoustic equipment. After that we will head towards the Rockall bank. It will take a 30 hour steam to get there, if the good weather holds. 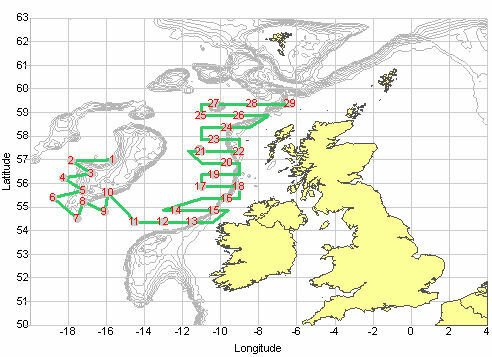 As well as the acoustic surveying, we will be trawling to confirm the species we are seeing on the acoustic equipment. We also have some hydrographic stations to sample, plankton to collect as part of a mackerel egg project, and we have a Marine Mammal Observer (MMO) on board. It should be an interesting three weeks! 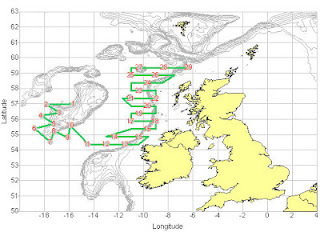 Irish blue whiting acoustic survey cruise track, showing hydrographic stations.